Russia’s military action, officially limited only to air combat operations, is to be directed against the so-called Islamic State (IS). Moscow’s rhetoric and propaganda, however, often uses the term ‘terrorists’ to describe the purpose of the operations. This term, as was already shown in the military campaign undertaken a few months ago by Turkey in Syria and Iraq, can be loaded with any conceptual content. The first weeks of Russian operations in Syria confirmed the earlier fears and suspicions of many observers that the Kremlin’s goal is not to fight with the Caliphate, but to defend the regime of President Bashar al-Assad. After a few weeks of the Russian activities in the Levant it is already known that the majority of their targets are, in a wider sense, rebel formations – both those regarded by the West as ‘moderate’, as well as those acting according to the ideology of political Islam. There is no doubt that the direct support of the Russians for the government in Damascus arrived at literally the last minute. For several months the situation of the Syrian government’s forces had systematically worsened on most fronts of the civil war. A series of spectacular failures of the loyalists in the spring and summer of this year in the north (mainly in the province of Idlib), and in the central part of Syria (Palmyra), as well as the transfer of fights by the armed opposition to the territory of Latakia (the socio-political cradle of the current government) effectively weakened the position of al-Assad, directly threatening the survival of his regime. Moreover, forces loyal to the government, exhausted by the four-year war, were not able to regain the strategic initiative. The support from its regional allies– Hezbollah, which has maintained a contingent of approximately 10,000 soldiers in Syria for three years now, Iran and even Iraq – was clearly insufficient. The defeat of the regime was looking increasingly likely. This was especially so since voices arguing for the need to establish a no-fly zone over Syria for Syrian aircraft (the US, Turkey, and some European countries, including France), began to increase in number and volume towards the end of summer. Moscow has perfectly selected not only the right moment to start its intervention, but also the scope and character. This is mainly in the form of combat and assault aircraft, the machines of the battlefield, and not fighter jets aiming to win dominance in the air by fighting enemy planes. The intense air support provided by Russian combat aircraft constitutes part of the battlefield, which, in the conditions of the Syrian conflict, may prove ultimately decisive. After two weeks of such Russian tactical air support for the pro-government ground forces in Syria, the armed opposition formations, operating in the provinces of Idlib and Latakia, had to withdraw from offensive operations. Meanwhile Syrian loyalists, for the first time in nearly six months, were able to conduct local counter-offensive operations on several sections of the northern front. According to sources in Syria and the region, the coming weeks will abound in large-scale offensive operations by government forces. Loyalists will benefit not only from heavy air support from the Russian Air Force, but also from the rapidly increasing military presence in Syria of Iran, Lebanon’s Hezbollah, Shiite militia in Iraq, and even (according to some sources) special forces from Cuba. The first in a series of such operations was probably the offensive in the region of Aleppo in the middle of October, where loyalist forces (composed of the government army, Hezbollah, Syrian self-defence forces, and the Iranian and Iraqi Shiite ‘volunteers’) effectively utilised the dominance of the Russians in the air and their support. The fact that this operation is directed personally by General Qasem Soleymani, commander of the Quds Force, the elite Iranian special formation (part of the Islamic Revolutionary Guard Corps, IRGC – colloquially: Pasdaran), clearly shows how important this action is from the perspective of Syria’s closest allies. Russia’s open military involvement on the side of the government in Damascus has caused a real political and strategic earthquake in the Middle East. The instant and extremely effective operation of transferring into Syria a strong air and land support, its successful deployment in difficult climatic and operational environment, and rapid incorporation of these forces for combat operations, was a surprise for regional and non-regional actors, who have been involved in Syria for years. The active Russian military presence in Syria on the side of government forces also means an actual end to the bold strategic plans of many regional powers, for example, Turkey and Saudi Arabia, who assumed the imminent removal from power of Bashar al-Assad and his whole political camp. Russia’s active participation in the war in Syria has ruled out (perhaps permanently) Saudi dreams of transforming the country into one ruled by Sunnis, and therefore closer ‘spiritually’ and politically to both Ankara and Riyadh. Russian involvement in Syria is also an attempt for Russia to show its presence in this part of the world in a much more concrete way than it has been able to in the past 25 years. Syria, ruled by a regime centred around the Alawite community, is in fact the last country in the region so closely associated with Russia. The loss of an ally (giving Moscow a number of strategic advantages, such as the ability to use its naval and air military installations) would mean for the Kremlin a serious loss of influence in the Middle East. For Russia, such a possibility is inadmissible, so active defence of al-Assad’s regime has become from the Russian perspective an urgent strategic necessity. Russian activity in the Levant will also have a direct impact on the strategic situation in other parts of the region of the Middle East. By supporting the government in Damascus militarily, Moscow pointedly and deliberately supported the so-called Shiite axis: an alliance of state and non-state forces (including Hezbollah) in the Middle East, ideologically and politically centred around Iran. Such an alliance has obviously existed for a long time, but it was consolidated after 2011 in the face of the revolts of the Arab Spring and the associated increase in the importance and power structures of radical Sunni Islam, first personified by Al-Qaeda and now also by the so-called Islamic state and its caliphate. Russia under Putin started to make effective use of the ‘Shiite instrument’ a few years ago as a tool in its multidimensional international politics directed against the West (and in particular against the United States). Russia’s current action in Syria moves this game up to a much higher strategic level. It is very important that Americans build and maintain their alliances in the Middle East based mainly on the Sunni countries (Turkey, Jordan, Egypt, Saudi Arabia, Kuwait). Thus, the current rivalry of powers competing in the world’s stage additionally inspires and intensifies the interfaith confrontation, persisting for several centuries now, in the hub of Islam in the Middle East. The Russian intervention in Syria means of course the necessity to redefine strategies and foreign policies of all the Middle Eastern actors, who have ambitions to influence the situation in this part of the world. By taking military action in Syria in defending the regime of al-Assad, Moscow has become part of the regional puzzle, an impossible to neglect element of the process of building the future governance in the Middle East. Analysing Russia’s military involvement in Syria, one cannot ignore those aspects with an impact (actual or potential) significantly beyond Syria and the region of the Middle East. There is no doubt that President Putin, by opting for a very risky play in the Levant, has also considered the global context. First of all, there is the question of the economic situation of Russia, which has been deteriorating at a rapid pace in recent months. This is mainly the result of a combination of two factors of external nature. The first of these is the serious fall in oil prices on world markets over the past several months, which reduces the liquidity of the Russian budget, eliminating almost half of the projected revenues from oil exports. The other is the cumulative effect of Western economic and financial sanctions imposed in 2014 after Russia’s aggressive actions against Ukraine. From the perspective of the Kremlin it is the Ukrainian issue that constitutes the primary geopolitical background of Russia’s ‘Levant operation.’ Putin’s intention is to bring about a situation in which the West (i.e. 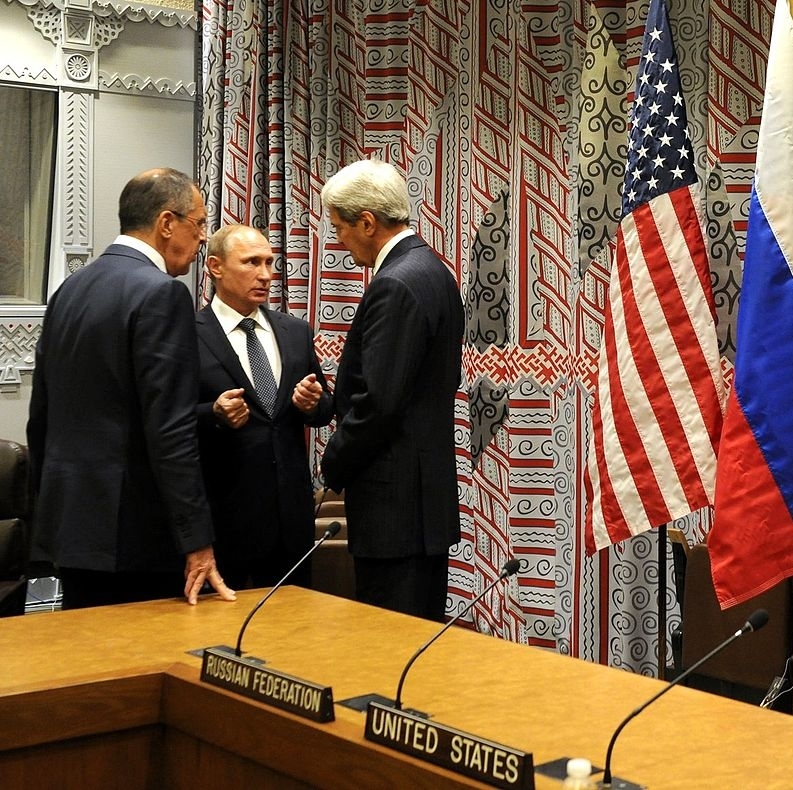 the U.S. and key EU countries) will be forced to conclude that without the participation of Russia they cannot solve the Syrian issue (and more broadly, to stabilize the situation in the whole environment around Syria). In return, Moscow is likely not only to request the lifting of sanctions, but also a greater flexibility of the West in the context of Ukraine (and the entire post-Soviet region). Russia is certain to put on the table of negotiations with the West its old demand to guarantee that EU and NATO processes of enlargement to the east will be blocked, and the current eastern borders of the two organizations will become the de facto borders dividing spheres of influence in Eurasia. It is worth remembering that the prospect of such a geopolitical arrangement, if it came into force, would be a serious threat to Poland’s safety and interests in the region. Our country would be at the front, located on the edge of a new ‘iron curtain’ separating the world of democratic freedoms from the world of ‘sovereign democracy,’ which is essentially a form of disguised tyranny. Russian involvement in Syria must be analysed from various angles as part of a complex and multifaceted Kremlin policy. Russia’s actions aim at simultaneous implementation of several strategic interests both with regard to Syria, the Middle East, as well as the West. The United States, NATO and the European Union need to be aware of the nature, scope and ultimate goal of Russian policy in the Middle East. Russia’s actions, both in Syria and the region of the Middle East, as well as towards Ukraine (a seeming fall in the involvement of separatists) cannot obscure the actual nature of Russian foreign policy. Ukraine’s future, and particularly the issue of its territorial integrity, sovereignty and the right for self-determination in the context of the selection of the country’s future participation in international political, economic and military systems, cannot be part of any bidding with Russia. This is all the more true considering the fact the price for such an arrangement cannot be the vague and uncertain strategic stability in the Levant, where Russia has in fact no key influence. In the current configuration in the Middle East, the so-called Islamic State is the biggest beneficiary. This group has found itself in a situation in which it is fighting against American coalition forces (Operation Inherent Resolve), against Turkey (Operation Martyr Yalçın) and Russia. In fact, each of these campaigns has completely different strategic objectives, and anti-ISIS slogans are only a media propaganda smokescreen. In such a reality the only forces actually fighting the Caliphate are the Syrian and Iraqi Kurds, Iraq and Iran, and, paradoxically, Syrian pro-government forces. If the West really cares about the destruction of the Caliphate and the end of the five-year war in Syria, it must change its policies towards the Syrian regime. Perhaps the option proposed recently by Prime Minister David Cameron, assuming the necessity of a transitional period involving the current President Bashir al-Assad (modelled on the Polish Round Table agreement of 1989), may turn out to be the best solution, since it would in fact be the only possible one. Especially, since Russian intervention in Syria has strengthened the regime, and practically pushed into oblivion any plans for replacing it with another political force.